I have been asked to blog about what has happened in the last month, and had been waiting for my big appointment that was today (Oct 3rd). This will probably be long and maybe a bit too detailed, just a warning. On September 1st I woke up to my ears feeling full and stuffy, something that reminded me of sinus pressure. Chris has a bike race he wanted to go to in Austin, and I was really wanting to get out of San Antonio for a few hours. I love Austin, so I would have been happy to be there for any reason. On the drive I kept feeling more and more dizzy and just not myself. I mentioned it to Chris throughout the day, but didn’t think anything of it until the evening rolled around. 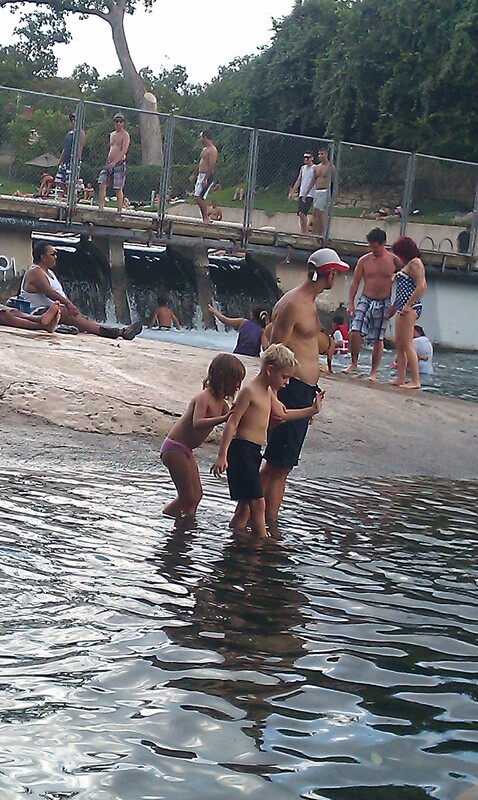 We took an unplanned stop at Barton Springs (I think that’s what it’s called, my memory isn’t very good right now.) We didn’t bring swimsuits, but we just let the kids swim in their shorts and undies. You can do that in Austin, because well, it’s Austin. It’s kind of a city where anything goes. One of the reasons I like it so much. I stayed out of the water with Sophia, but as the minutes were passing it was harder and harder to keep my head up straight. It felt like it has suddenly become a bowling ball, and my shoulders were too weak to hold it up. Finally, after about 30 mins in the water I got Chris’ attention and we got out of there. Back in the car we went and headed for the bike race Chris was racing. After walking to some shade with the kids, I collapsed at a table and let the kids play in rocks. Luckily for me, Chris’ race did not last long and we headed back home. The trip home was unbearable. The nausea, dizziness, and the head feeling like it weighed a ton was just about as much as I could take. As soon as we got home I walked in the door, headed for the shower (which little did I know that shower was the only one I was going to have for the next 3 days) and went straight to bed. I don’t think I even said goodnight to anyone. I was done and needed to just pass out. The next morning hit me like a Mac truck hitting a deer…I was the deer. Chris had taken the 2 older kids to church and I was home with the baby. I woke up to Sophia crying and quickly realized I was alone. The moment I lifted my head off the pillow, that was the moment the truck hit me. I basically melted onto the floor and belly crawled to Sophia’s room. I don’t even remember how I got her out of the crib without falling over. The only thing I can think of is Angels held me up. I got her on the floor and she followed me into the living room where my phone was to call Chris. Luckily he was running late, and could answer. He immediately came home. As I waited, the movement proved to much, and that’s when the vomiting started and wouldn’t let up. Before long, Chris came to my aid and carried me to my bed where I stayed for 3 days. The 3 days were filled with pain, dizziness, ear ringing called Vertigo and I seriously thought I was dying by day 3. I could only lay in one position. If I moved a hair I was aiming for my trash can. My body went into paralysis which went to my hands, feet, face and everything in between. It got to the point where I couldn’t even speak. That’s when the ambulance was called. Luckily it was a sign of dehydration and not a stroke which was what Dr’s. thought. When the paramedics came they took my glucose and it was a 49, and I remember eating a tube of goo to get it up. I don’t remember putting up much of a fight with it. After the brief emergency room stay they admitted me for 4 days. I look back on it and think how useless and unnecessary that was. ENT’s (Ear nose and throat) dr’s do not make it a habit to go to the hospital unless they are there for surgery. So, they did some testing to mostly rule out tumors in the brain and strokes. Luckily those were not the causes. My MRI, MRA, CT Scans were all normal. I was well medicated which was awesome. No dizziness means no nausea, which means I could eat. After day 4, they sent me home with a referral to one of the best ENT’s in the San Antonio area. So, I guess if I was sent to one of the best, it wasn’t useless. A month later, another MRI with contrast, balance test, hearing tests and medication we find out that it was a very rare hemorrhage in my inner ear that caused this crap. This month has been one of the hardest in my life. Mainly because I have to rely on Chris for so much, and I am not the mom I need and want to be. My balance is gone and have to use a walker if I do even get up. My hearing is very sensitive with constant ringing or constant sound that intimidates the Cicada bug and just Sophia’s cries can almost send me to tears. I have caught up on a few sitcoms, thanks to Netflix and played a few video games. I have become the ultimate couch potato! Today I opted for the steroid shot in my eardrum. Before taking Prednisone the hearing loss was what the Dr. called catastrophic. Bascially it was “unaidable” meaning a hearing aid would not help. Today before my shot, I had to take another hearing test. It showed slight improvement! Enough so, that a hearing aid would help me. The Dr. told me these type of hemorrhages do not usually reverse damage that had already happened. So, this little happening is nothing short of a miracle in my book. We hope with the shot I will have more improvement in my hearing, and in theory is my balance will take note and follow suit. I am really hoping this is the case because I miss driving SOOOO MUCH! Heck, I miss living a normal busy mom life. Sitting on the couch is fun and all for the first few days to relax, but a month of it is a good way to go nutty. My next step is to find out why my inner ear had an hemmorhage. The ENT wants me to get checked out with an Ocologist. He told me I needed to rule out blood disorders, cancers, aneurisms and all the other scary crap that a 36 year old mother of 3 young children should not hear or deal with. Heck, no one should have to. After calling the Oncologist, I was told she does not see anyone until they have proven cancer. So, as much as I want answers I am not owning up to that one. My next step to getting a hold of my ENT and find out what I should do now. So my journey continues and hopefully I can get more answers very soon. Thank you for all your prayers, happy thoughts, help we have received and your friendship and for the family love. Without the help from you all, this past month would not have gone as smoothly as it has. We are very grateful!